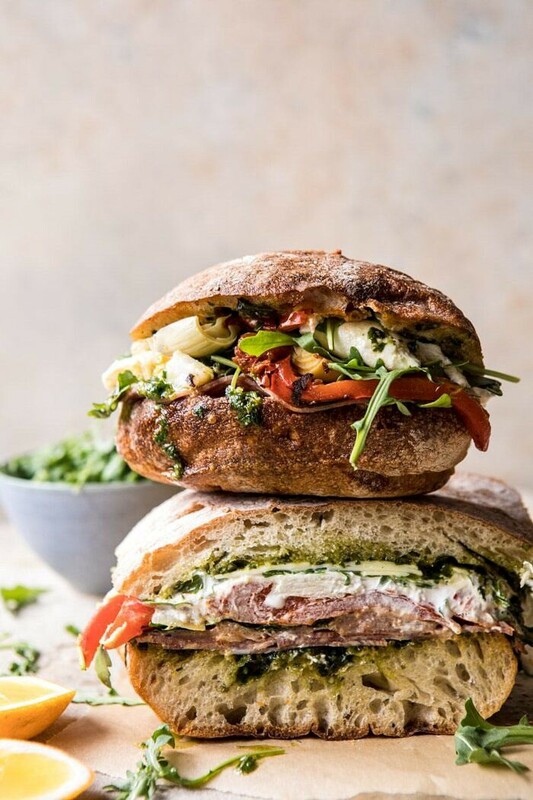 Meet your new sandwich, the Antipasto Mozzarella Sandwich with Lemony Basil Pesto. Happy Thursday! I am currently in lighting mode, yep, I’m in the process of choosing the lights for the studio barn. Oh my gosh, it’s kind of hard. We have been working on the lighting for forever now, and I’m excited to be almost done with it. My mom is honestly doing the grunt of the work, sending me text after text of lights to decide between. Decisions, decisions, UGH. Send help! So that’s kind of been my day. Lighting. Not too exciting, but kind of exciting because it means we are getting closer and close to the studio being finished. Sorry, that was totally random, but I just had to share. Normally, I don’t make a lot of sandwiches. They tend to be hard to photograph and to be honest, I just really, really love bowls of food. Like not only do I love eating food out of bowls, but I love photographing food in bowls. I know, I’m weird, but hey, it’s me. Recently however, I felt the need to shake things up. I need a good change, you know? Something fresh, and new, and different. Anyone else feeling this way? Like a spring refresh? OK great, we are on the same page. 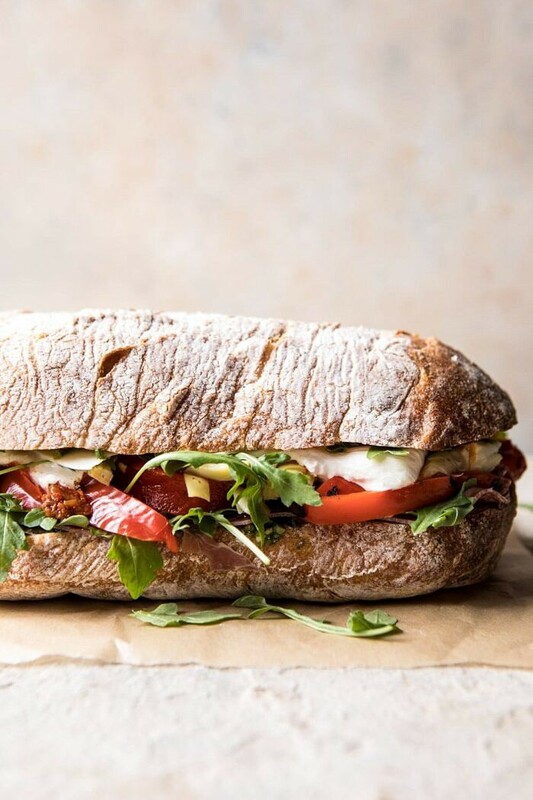 So no bowls of food today, instead we are talking Italian sandwiches (don’t worry, the bowls will return next week). 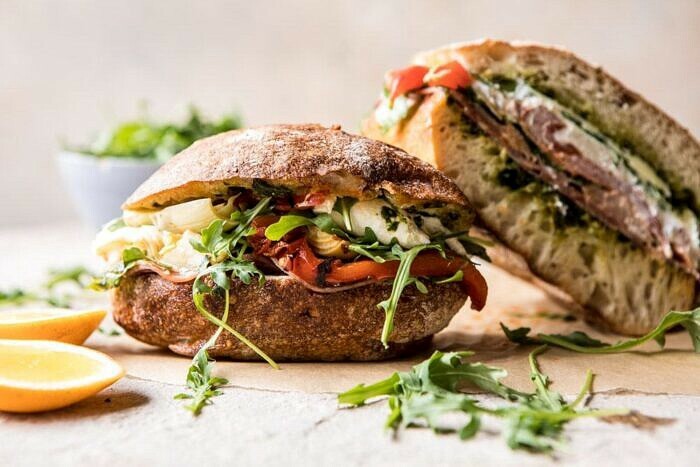 And you guys, these Italian sandwiches are so good. 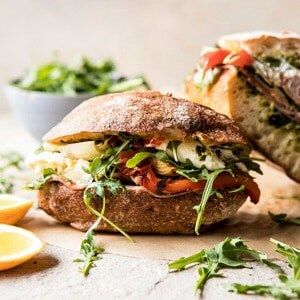 So good that I’m now convinced, these are the sandwiches to have on hand for any unexpected guests who happen to pop-in for a lunchover (yeah, I made that one up). Just make them ahead on Sunday and they’ll be all ready to go any time throughout the week. 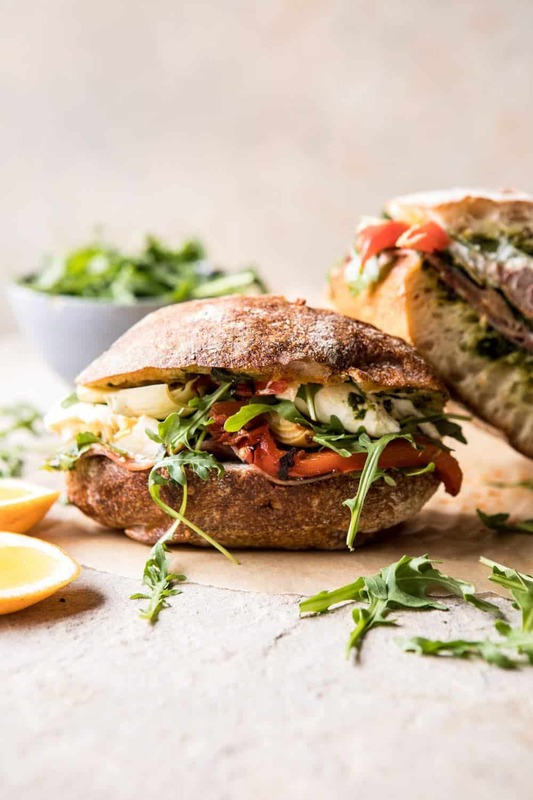 If you’ve ever had a pressed Italian sandwich, these are similar, but better, fresher, and just all around more delicious…let me break it down for you. One, instead of store-bought pesto we’re making our own homemade lemony basil pesto. I know it might take you five or ten minutes more to make the pesto, but just go with me on this. Homemade pesto steals the show. It’s fresher, tastier, and not to mention, healthier. Just make it. Two, good bread. Ciabatta to be exact. It’s perfect for this style sandwich, because it holds up well to the saucy filling. 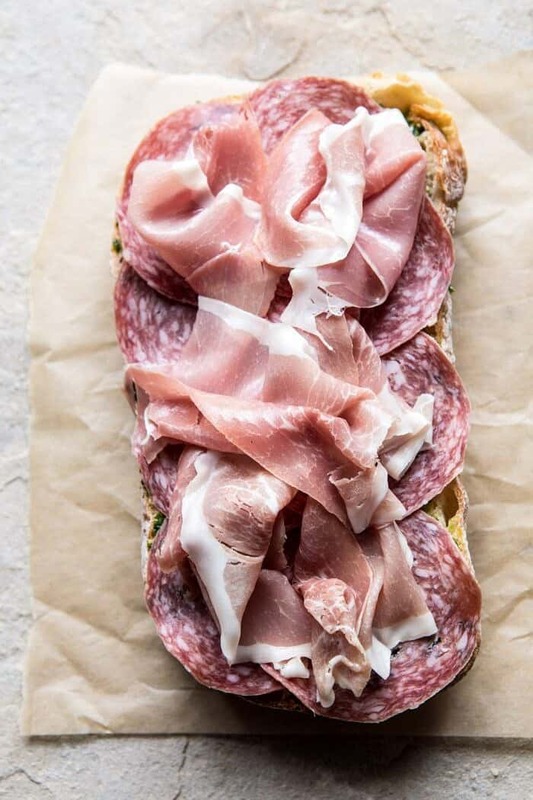 Three, spicy salami and prosciutto. I don’t typically love the meats, but in this case, it works. The spicy salami is what’s key to me, but we like spicy food over here. 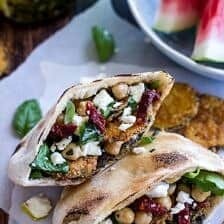 Also, I do want to mention that if you are vegetarian, you can totally omit the meats, OR just make these spicy chickpeas and use them in place. I think the chickpeas would be really delicious. Four, all the veggies. I’m talking roasted red peppers, marinated artichokes, sun-dried tomatoes, and arugula. 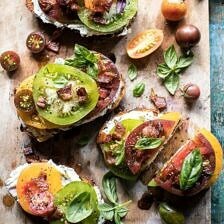 Lots and lots of veggies, they balance out the meats and makes for the all around perfect sandwich. Plus, you know I love my veggies. Five, fresh burrata (or mozzarella) and provolone. Yes, yes, yes. You can’t do this sandwich without the cheese. I used burrata and provolone, but mozzarella works great too. Originally, I had planned to use fresh mozzarella, but when I opened my fridge all I found was a ball of burrata. I obviously was not complaining, you guys know I have a serious obsession with burrata. And while it did make the sandwiches a little less pretty, it also made them a little more tasty. So I’ll leave that choice up to you, but I think you’ve got a good idea of my opinion on the matter. You see? The best sandwich ever. And not only is it delicious, but the longer you let the sandwich to sit, the tastier it gets. Allowing the flavors to mend in the fridge creates a delicious marinated sandwich. You can eat this cold right out of the fridge, or toast it up in the oven. Either option is great. 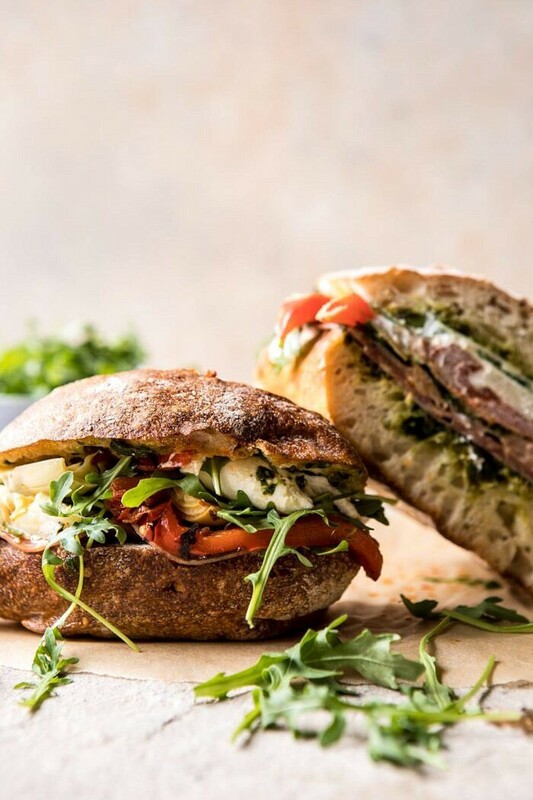 These sandwiches make for the perfect fancied up weekday lunch (your coworkers will be so jealous…or just bring an extra one along and share!). They would also be great to pack up and take on a spring picnic. Oh, and if you happen to be serving Easter lunch, this sandwich would be perfect for that too. Just one thing, don’t skimp on those veggies. Best part of the sandwich. Ok, and the cheese. 1. Lay the bread cut side up on a clean work surface. Working with the top piece of the loaf, pull out some of the insides to create a space for the filling. 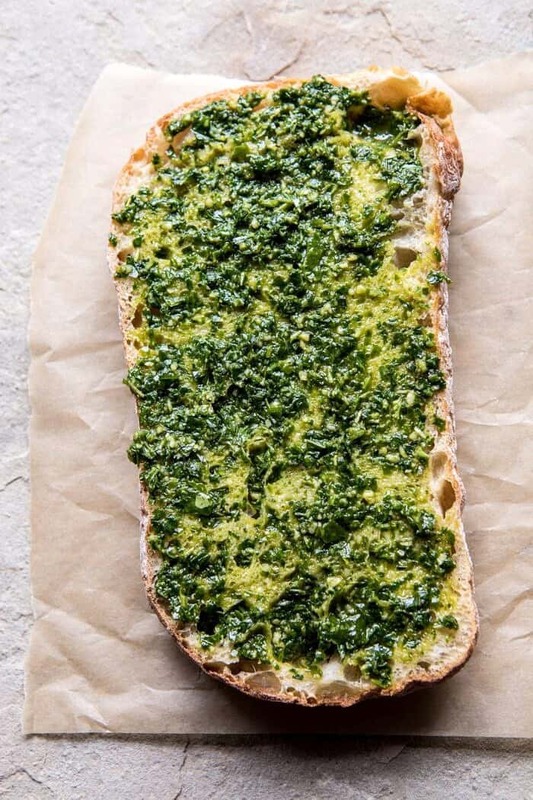 Spread both cut sides of bread with pesto. 2. Working with the bottom piece of bread, layer on the salami, prosciutto, artichokes, red peppers, and sun-dried tomatoes. Tear the burrata and layer evenly over the veggies. Add the provolone. Sprinkle the arugula over top. Add the top half of the ciabatta and gently push down on the sandwich. 3. Wrap the sandwich tightly in plastic wrap and place in the fridge for 1 hour or up to 1 day. Before serving, cut into 4-6 sandwiches. 4. Alternately, you can warm the sandwich in a 350 degree oven for 15 minutes or until the cheese is melted. This is really good. 1. In a blender or food processor, combine all ingredients and pulse until chunky smooth. Taste and add salt as needed. Keep stored in the fridge for up to 2 weeks. 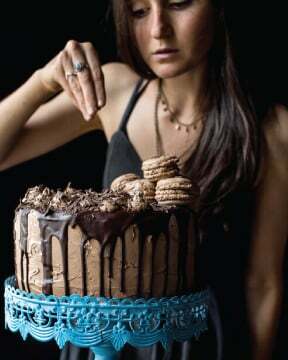 All the layers of deliciousness. Yum. 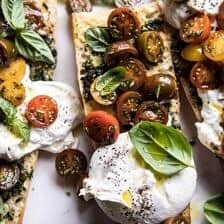 Caprese Burrata Garlic Bread + Video. Everything I love in a sandwich : DREAMY! Makes me crave summer so muuuuch. That’s one super delicious sandwich. 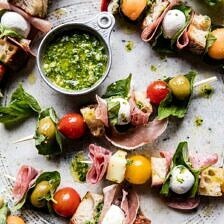 I love antipesto and Italian cold cuts (iike hot Genoa salami). That’s interesting how you mentioned that the sandwich gets better if you let it sit for a while. I hadn’t thought about that before. Thanks for this great idea. Definitely an epic sandwich. Good luck with the lighting decisions!! 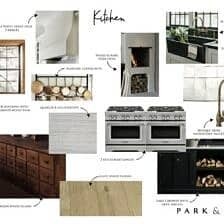 Lighting was actually my most difficult decision with my major home remodeling project last year, since there’s just SO many lighting choices out there – sheesh. But thankfully I found the perfect lights for every room, so I hope your search is as stress free as possible from here on out. Thank you so much Liz! I hope its stress free as well! Haha! 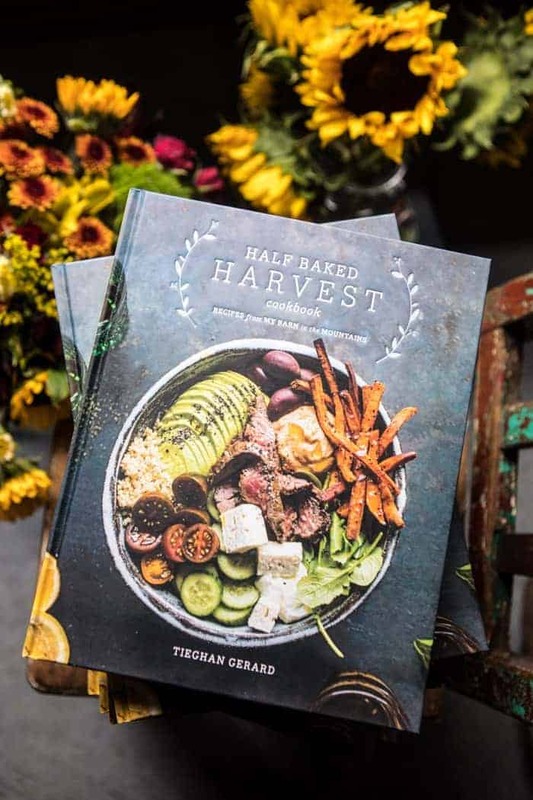 That lemon basil pesto sounds AMAZING! Pinning this for future reference. Thanks Shannon! I hope you love this! Oh my gosh, this is the lunch of my dreams. 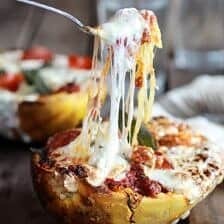 What’s the best way to keep it holding up/fresh/not soggy if I make it over the weekend to take to lunches during the week? this looks absolutely beautiful!! 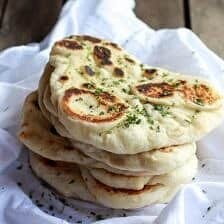 all of your recipes are so inspiring, im going to need to try a few this weekend! My kinda sandwich… and I totally hear ya on preferring to photograph food in bowls. Same here! Made this today to eat tomorrow at a picnic at a winery. So excited. Will definitely post a review and a pic if I can! Thank you for the fabulous recipe!! I would love to see a photo! 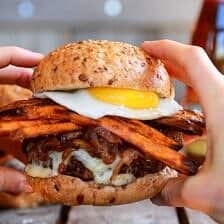 I hope you love this recipe, Jessica! Thank you!